The climate change movement has seen a dramatic shake-up in recent years with the birth of a primarily student- and youth-led movement to remove investments in the fossil fuel industry. While the demands of the fossil fuel divestment movement vary, the most common aim is to encourage institutions to divest from the Carbon Underground 200 – a list which identifies the top 100 public coal companies globally and the top 100 public oil and gas companies globally, ranked by the potential carbon emissions content of their reported reserves. Other campaigns, such as those of the universities of Oxford and Washington, have targeted the most carbon- and capital-intensive fossil fuels such as coal and oil or tar sands. At the core of all such action is a recognition of and calling out of the unsustainable and harmful business model of the fossil fuel industry. Beginning in spring 2010 on the campus of Swarthmore College, the student group Swarthmore Mountain Justice formed a coal divestment campaign in solidarity with frontline communities fighting against mountaintop removal coal mining in Appalachia (Grady-Benson and Sarathy, 2015). In autumn 2011, Unity College became the first university to divest. By the end of 2013 – just over two years after the movement began – more than 70 institutions had committed to divest. By September 2014, the number of commitments had more than doubled to 181 entities and 650 individuals with control over approximately US$50 billion in total assets (Arabella Advisors, 2014). Representing a fivefold increase, by September 2015 over 442 institutions representing US$2.6 trillion worth of assets, including the Norwegian Sovereign Wealth Fund, the University of Oxford and the Church of England, had all announced plans to divest themselves of some or all of their fossil fuel holdings (Arabella Advisors, 2015). In the run up to COP 21 in Paris more than 100 additional institutions, controlling $US800 billion, committed to divest – bringing the total to $3.4 trillion. The fossil fuel divestment movement (FFDM) is inspired by a powerful history of students calling for institutional investments to match the values of those institutions. Most prominently, it is modelled after the South African apartheid divestment movement, which asked for institutions to divest from companies operative in apartheid South Africa (see Massie, 1997). In October 2013, Oxford university’s Stranded Assets unit released a report examining the history of divestment movements and illustrating the different waves in which they typically occur (see Ansar et al., 2013). In the first wave of divestment, small US institutions divest and so begin to shift the tide of public opinion. In the second wave, bigger, more prestigious US institutions divest. The second wave typically marks a tipping point which triggers the third wave of divestment, global divestment and, potentially, the wide-scale shifting of social and market norms. According to the report, the increasing numbers of people trying to get investments out of the fossil fuel industry represents the fastest growing movement of its kind in history. Reflecting on the progress of the FFDM since the report, the movement is growing so fast that it has arguably already entered the second and third wave of divestment, i.e. entailing the shifting of market and social norms and divesting by major international pension funds and universities – progress it took other divestment movements many more years to achieve. While keeping track of the size of the movement is difficult, in the space of just four short years the divestment movement has grown from a single campaign on a small college campus in the US to over 400 campaigns in the US and over 800 in total globally in places as diverse as South Africa, Australia, New Zealand, India, Bangladesh, the United Kingdom, European countries, the Marshall Islands, Canada and more (Grady-Benson and Sarathy, 2015). While the campaign is still largely student- and youth-driven, it has garnered high-profile support from the United Nations (UN), the World Bank, the United Nations Framework Convention on Climate Change (UNFCCC) and many more (King, 2015a). The profile, size and rate of divestment is rapidly increasing, and not only is the fossil fuel divestment movement helping to draw attention to the moral urgency of acting on climate change and moving beyond fossil fuels, it is also drawing significant public attention to the carbon bubble and the financially unsustainable nature of the fossil fuel industry’s collective and individual business models (King, 2015b). As a result of the movement’s growth both in and beyond institutions of higher education, the FFDM has arguably had significant influence on the public, the financial industry and climate change movements at large. Of course, attributions of causal influence are difficult in such a complex space with multiple different factors at play, but as the next sections hope to illustrate, the FFDM has arguably played a major role in shifting ways of thinking around climate change, enabling coalition building, and has expanded its influence well beyond college campuses and into the international realm. Systems thinking may help shed light on the importance of the fossil fuel divestment movement. Applying this thinking to climate change, our system in this case is world society interacting with the planet’s climate. Within this system, it is clear that human activity – particularly the burning of fossil fuels – is largely responsible for current observed warming trends in the earth’s atmosphere (IPCC, 2014). However, it is also clear that actions in response to this warming – current policies and individual lifestyle changes – are not sufficient to prevent dangerous global warming (Peeters et al., 2015). The FFDM is helping to push past this inaction and the limited analysis and paradigms that underpin it. To better understand how, we can turn to Donella Meadows (2009), who addresses 12 ways to intervene in a system so as to create feedback loops and larger-scale change (Table 1). Among those leverage points are: numbers, constants and parameters (number 12); and the paradigms within which the system functions (numbers 1 and 2); both of which can be found at the heart of the FFDM. Moreover, the rules and structure of the system (numbers 5 and 6) are also being affected, as fossil fuel divestment campaigns aim to empower young people, shift power dynamics and stigmatise and penalise corporations that are obstructing progress on climate change. 2°C The maximum amount of total global temperature rise that the Intergovernmental Panel on Climate Change stated can occur before serious feedback loop thresholds – such as ocean acidification and permafrost thaw methane release – will likely begin. This is also the maximum amount of total average global temperature rise that UNFCCC countries have committed to as part of the COP15 agreement in Copenhagen, Denmark, in 2009. 565 GtCO2 (Gigatons of Carbon Dioxide) → The maximum amount of carbon dioxide, according to the Carbon Tracker Institute, that can be emitted in order to stay within the two degrees Celsius warming limit. 2,795 GtCO2 The amount of carbon dioxide already contained in the proven coal and oil and gas reserves of the fossil fuel industry – including both state- and privately owned companies. The contradiction between the amount we can afford to burn if we are to avoid climate destabilisation and the reserves held by the fossil fuel industry is significant. Indeed, if governments regulate fossil fuels in line with the two degrees target, then two thirds to four fifths of the reserves that fossil fuel companies count as assets on their balance sheet may not be monetised and could become stranded assets (IPCC, 2014). The amount stranded depends on how high of a chance of staying below two degrees is acted on alongside other factors such as the feasibility of carbon capture and storage (see CTI, 2013). The above contradiction is worrying not only for our climate but also for financial markets. The pioneering work of institutions like the Carbon Tracker Initiative (CTI), HSBC Bank and others have illustrated that this contradiction could potentially result in a systematic overvaluation of fossil fuel companies (CTI, 2012; 2013). Furthermore, not only is the value of publicly traded fossil fuel based on their current reserves, the majority of which may not be burnable, they are also expending approximately 1 per cent of global gross domestic product (GDP) on developing new reserves (CTI, 2013) – ironically this is about the same amount required to invest in the clean economy in order to stay below the 2°C target (see Stern, 2007; IEA, 2014). Building on their work, it has been estimated that staying below the two degrees target could result in losses of revenue for the fossil fuel industry of up to if not more than US$28 trillion in the next two decades, and potentially over US$100 trillion by 2050 (Lewis, 2014; Channell et al., 2015). The drivers behind fossil fuel companies losing value are not limited solely to climate regulation, but include the changing economics of clean energy, increasing costs of fossil fuel extraction, possible litigation, and a range of other factors (see Paun et al., 2015). The potential risk this poses to investors has been referred to as carbon risk, which forms part of a potentially systematic overvaluation on the financial markets. This has been referred to as the carbon bubble. As such, while the fossil fuel divestment movement is modelled on other successful divestment campaigns, there are significant differences. Unlike other divestment campaigns, alongside its ethical and political motivations, divestment from the fossil fuel industry has a significant financial motivation associated with potential systematic overvaluation of fossil fuel companies on financial markets and the potential to align our investments with a relatively safe climate future. Reflective of the power of numbers to shift paradigms, the numbers and figures underpinning the carbon bubble have been at the core of the case for fossil fuel divestment, demonstrating that the overwhelming majority of known fossil fuel reserves must be left in the ground in order to meet the challenges of global warming. This realisation has been at the centre of the Leave it in the Ground (LINGO) movement, which has been motivating a transition to renewable energy and reduced dependence on fossil fuels. Perhaps most significantly, LINGO has helped move the conversation on climate change from a standpoint of reducing emissions to a focus on the need to leave fossil fuels in the ground, unburned. While we cannot say that the current prominence of LINGO is due solely to the FFDM, particularly as it is a concept that predates the campaign, the movement has certainly helped bring it to light (see Bond 2011; Klein, 2014). For instance, the Guardian Media Group’s focus on climate change, and their subsequent #KeepItInTheGround campaign, has been inspired by campus fossil fuel divestment campaigns (Rusbridger, 2015). Beyond The Guardian, the movement has garnered an exponentially growing amount of media coverage, with thousands of divestment-related stories being published in media outlets since the movement began. On a deeper level, there have been shifts in the paradigm thinking around responsibility for climate change. Previously, responsibility for climate change has been predominantly attributed to either individuals (Peeters et al., 2015) or countries at large, and the organisations – such as the United Nations Framework Convention on Climate Change – that represent them (Kutney, 2014). The FFDM has helped broaden the scope of responsibility to include the role that the fossil fuel industry has played in both contributing to and blocking progress on climate change. It has helped establish an environment where it is possible to talk about the morality of fossil fuel corporations, exposing the unsustainable nature of their business model, highlighting their tactics of deception and misinformation, and in doing so revoking their moral and social license (Mulvey et al., 2015). This has particular significance for institutions of higher education that have not only had their scientific products undermined by fossil fuel industry misinformation –increasingly the economics of clean energy and the feasibility of a transition are being undermined by industry disinformation. In the words of Paul Krugman (2015), ‘old Energy is engaged in a systematic effort to blacken the image of renewable energy, one that closely resembles the way it has supported “experts” willing to help create a cloud of doubt about climate science’. It is through revoking the moral and social license of the fossil fuel industry that divestment activists may have some of their more profound effects. As a University of Oxford Stranded Assets Programme report illustrates (Ansar et al., 2013): through stigmatisation of targeted industries ‘almost every divestment campaign […] from adult services to Darfur, from tobacco to South Africa, divestment campaigns were successful in lobbying for restrictive legislation’. Similarly, the social and political power that the FFDM brings to bear seems set to spur on significant restrictive legislation, if it has not had a role in doing so already. This is especially prominent when coupled with considerations of how the divestment movement is a training ground for much broader climate justice work and serves as a solidarity network and partner in the broader climate justice movement. Fossil fuel divestment has often paved the way for coalition building, both within the movement and among other justice groups. On one level, the FFDM allows campus campaigns to directly connect with communities on the front line of fossil fuel extraction and infrastructure development. For example, many campus divestment chapters have organised events and collaborations in solidarity with carbon pricing initiatives and campaigns against mountaintop removal coal mining (MTR), Arctic drilling and hydraulic fracturing (fracking) (Aronoff and Maxmin, 2014). Beyond environmental justice, many divestment groups have organised events in collaboration with the Black Lives Matter movement, and are working on the intersection of racial and climate justice (Divest Harvard, 2014). Other groups, such as Divest Columbia for a Fossil Free Future, have worked with campus prison divestment campaigns. Furthermore, fossil fuel divestment campaigns have created space for network building among campuses themselves as evidenced by the Divestment Student Network. Other FFDM benefits are oftentimes overlooked. For example, it is also a training ground for new and young climate justice organisers, thus growing the climate change movement at large. The FFDM trains many student organisers en masse, oftentimes attracting students who are not already engaged in environmental activism. Thus, a new generation of climate leaders is emerging. Moreover, the FFDM also creates a network within which larger-scale events may be organised. An example of such was the XL DISSENT campaign, a youth-led nonviolent civil disobedience against the Keystone XL pipeline that was held in March 2014. The event, which brought together hundreds of young people to Washington, DC, was organised primarily by students organising for fossil fuel divestment at universities across the country (Democracy Now, 2014). The networks and coalitions created by campus campaigns facilitated the organising of the event. Power dynamics are at the core of understanding climate change and climate justice. Inherent to justice issues are different realms of power that affect and disempower different social groups (Foucault, cited in Rabinow, 1984). Typically speaking, elites, in an effort to maintain the status quo, ‘supply other people with the mental frames for understanding, interpreting and interacting with the world’ (Malitz, 2012). This realm of power (Foucault, cited in Rabinow, 1984) is one in which the group being disempowered is often not fully aware of the direct way in which power is exerted upon them. This is particularly important in the case of climate change, for as Kofler and Netzer (2014) point out, ‘only rarely are there immutable facts or technical conflicts that impede or even prevent the expansion of renewable energy. Instead, long-established structures and elites problematise the challenges of an energy transformation and sustain the existing system and their own (market) power with corresponding narratives’. 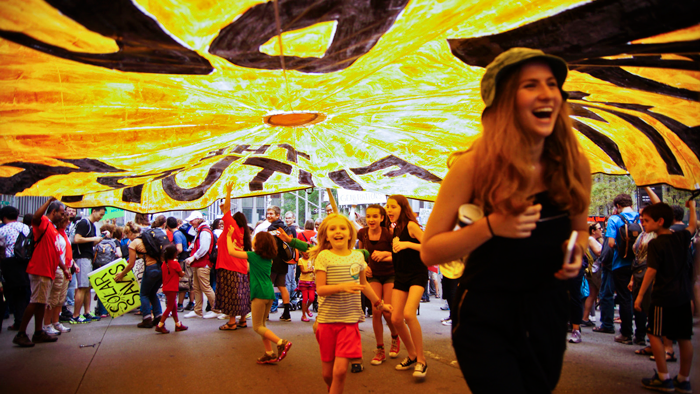 In the face of elite narratives holding back a clean energy transition, the fossil fuel divestment movement has helped shift those power dynamics and empower young people who have frequently felt disempowered within climate change discussions (Langholz, 2015; Pilrainen, 2015; Yona, 2015). By leveraging the influence of centres of power and credibility such as religious, academic and charitable institutions, the FFDM is providing authority to the voice of young activists and challenging the narrative of the fossil fuel industry on clean energy and the prospects of tackling the climate crisis. When previously youth had been tokenised within spaces like the UNFCCC and refused a seat at the table, the FFDM has helped empower them both within and outside of these spaces and provided them with a louder voice, catapulting the local conversations about fossil fuel divestment that were being had at university campuses to the international stage. For instance, the FFDM is challenging the transnational powers of multinational corporations within the UNFCCC. The COP20 in Lima, Peru (2014) is an example of how the FFDM helped question the legitimacy of fossil fuel corporations’ presence at the UNFCCC talks. At the summit, the Global Carbon Capture and Storage Institute organised a side event initially titled, ‘Why Divest When a Future with Low Emission Fossil Energy Use is Already a Reality?’ The event rapidly drew widespread condemnation from civil society groups present at the conference (Henn, 2014). Its name subsequently changed numerous times, omitting the mention of fossil fuel divestment. These changes still did not prevent media attention, particularly since many divestment campaigns utilised their social media presence to draw attention to the event; on the day of the event, protest actions were organised within the UN convention centre, leading to a significant blockade of the event (DeMelle, 2014). Many activists drew parallels between the ethics and legitimacy of allowing polluters into a climate change conference with the presence of tobacco companies at World Health Organisation (WHO) summits, arguing that, like tobacco companies, fossil fuel companies could not be part of the solution (Henn, 2014; Supran and Achakulwisut, 2014). Such developments contrasted with the previous year’s COP19 in Warsaw, Poland, where a summit of the World Coal Association took place next to the UNFCCC convention venue. At the World Coal Association summit, UNFCCC secretary general Christiana Figueres agreed to be a keynote speaker, despite protests by civil society groups (The Global Call for Climate Action, 2013). Contrasting the two occasions, the events that took place at COP20 represent a different industry response to civil society pressure compared to past COP interactions: whereas at COP19, fossil fuel industry events took place without a hitch, at COP20 the industry came under significant scrutiny. Due to the rapid turnover of university students, a growing number of alumni have worked on fossil fuel divestment campaigns. Many of these alumni have continued to engage in and organise for climate change – for example Morgan Curtis, a recent graduate of Dartmouth College, is now a youth delegate for the COP21 United Nations climate change negotiations in Paris. Similarly, Kyle Murphy, co-founder of Divest University of Washington, is now a co-director of Carbon Washington, a non-profit running a carbon tax ballot initiative in Washington State. Teddy Smyth, a campaigner for the Middlebury College divestment campaign, now works for Next Gen Climate New Hampshire, an organisation dedicated to making climate change an electoral issue. The list of fossil fuel divestment activists now working on climate justice could certainly go on. The FFDM also engages older alumni in its effort to sway university trustees and administrations. Examples of these decision-making alumni include Christiana Figueres, secretary-general of the UNFCCC, who recently endorsed fossil fuel divestment from Swarthmore College, her alma mater (Goldenberg, 2015). Others include civil rights activist Cornel West and actor Natalie Portman, who both urged Harvard to divest from fossil fuels (Klein, 2015). Beyond these influential alumni, many college fossil fuel divestment campaigns have created escrow funds that allow alumni to divert their donations to a fund that will only be made accessible once the alma mater divests. Additionally, campaigns at a couple of dozen institutions – including Boston University and Dartmouth College – have collaborated in a Multi-School Divest Fund, which allows alumni to pool their resources together in an escrow fund. By December 2017, the funds received will be divided equally, but only among the schools that have divested (Rocheleau, 2015). Through its engagement with alumni, the FFDM is helping to spread the divestment and LINGO movement well beyond campuses and into communities across the globe, often in powerful and influential places. Looking forward, the divestment movement arguably has growing potential to help bolster the broader climate justice movement and spur on the enactment of climate policy. This is of particular significance given that FFDMs took off primarily within developed countries who have typically been perceived as laggards within the UNFCCC space, such as the United States, Australia and Canada; countries which arguably have a strong moral responsibility to act under the principle of Common but Differentiated Responsibilities, central to the UNFCCC and most accounts of climate justice. In these countries, the FFDM is helping to provide the political and social space required to enact policies like carbon pricing, fossil fuel subsidy reform, and more. Moreover, we expect the FFDM to play a growing role in helping promote the conversation around decarbonisation and the push for 100 per cent renewable energy by 2050 as it continues to grow (Sachs, 2015). Furthermore, while many activists are (perhaps too) quick to grant that divestment is not about directly bankrupting the fossil fuel industry, the influence on the investment world is increasingly evident and rapidly growing. As both the University of Oxford Stranded Assets Programme (Ansar et al., 2013) and Peabody Coal have realized, divestment efforts ‘could significantly affect demand for [fossil fuel] products’ and could ‘indirectly influence all investors […] to go underweight on fossil fuel stocks and debt in their portfolios’. It seems, furthermore, that such impacts are already with us. For instance, as Shawn McCarthy (2015) reports, the FFDM has already ‘grown into something much larger and more threatening to producers [than simply a political movement], as pension fund managers and other institutional investors are now questioning the long-term returns offered by coal and oil companies’. Following in the footsteps of a number of financial institutions, HSBC Bank recently issued a research report warning investors that the fossil fuel industry is at serious and growing risk of stranded assets from climate policies and unfavourable economics. In their report, HSBC suggested a number of different divestment strategies and argued that divestment could affect fossil fuel production and extend the carbon budget by creating ‘less demand for shares and bonds [which] ultimately increases the cost of capital to companies and limits the ability to finance expensive projects, which is particularly damaging in a sector where projects are inherently long term’ (Paun et al., 2015). If HSBC and a number of analysts are correct, the FFDM will continue to grow and help to shift significant amounts of capital. Such a shift is urgently needed, for as the financial analysts at the 2° Investing Initiative (2013) have pointed out, ‘divesting from fossil fuels is an integral piece to aligning the financial sector with a 2°C climate scenario’. Their claim is substantiated by the International Energy Agency (IEA), which estimates that alongside a major increase in clean energy investments, reductions in fossil fuel investments of US$4.9 trillion and additional divestment away from fossil-fuelled power transmission and distribution of US$1.2 trillion will be needed by 2035 if we are to achieve the internationally agreed-upon 2°C target. Furthermore, because we are seeing the FFDM expand to target banks, foundations, pension funds, and financial institutions with growing amounts of success, the movement is increasingly helping to shift much greater amounts of capital. While the divestment movement began with just a few small campaigns on campuses in the US, the movement has grown significantly and its impacts and reach are increasingly vast and global in nature. Of course, divestment efforts when viewed in isolation are seemingly insufficient to the task of addressing the climate crisis as they do not directly address many facets of what is required to tackle the crisis. However, as we have highlighted, when viewed in the broader context of the growing climate justice movement, the FFDM has been a powerful force multiplier, ally and partner, which has helped propel issues such as LINGO, climate justice and the carbon bubble into the foreground of public consciousness and which can help spur on some of the requisite legislation needed to leave fossil fuels in the ground. Thus, while the FFDM is by no means the sole solution to the climate crisis, it is increasingly proving that it is an important component and driver of the broader alliance of civil society, politics, science, and industry who are developing a convincing alternative and positive narrative to counter the fossil fuel industry narrative and implementing them against resistance. 2° Investing Initiative (2013). From Financed Emissions to Long Term Investing Metrics: State of the Art Review of GHG Emissions Accounting for the Financial Sector. Ansar, A., Caldecott, B. and Tilbury, J. (2013). Stranded Assets and the Fossil Fuel Divestment Campaign : What Does Divestment Mean for the Valuation of Fossil Fuel Assets ? Oxford: SSEE-University of Oxford. Arabella Advisors (2014). Measuring the Global Fossil Fuel Divestment Movement. Arabella Advisors (2015). Measuring the Growth of the Global Fossil Fuel Divestment and Clean Energy Investment Movement. Aronoff, K. and Maxmin, C. (2014, 9 April). A Generation’s Call: Voices from the Student Fossil Fuel Divestment Movement. Dissent Magazine. Bond, P. (2011). Politics of Climate Justice: Paralysis Above, Movement Below. Pietermaritzburg: University of KwaZulu-Natal Press. Channell, J., Jansen, H. R., Curmi, E., Rahbari, E., Nguyen, P., Morse, E. L., Prior, E., Kleinman, S. M., Syme, A. R. and Kruger, T. (2015). Energy Darwinism II: Why a Low Carbon Future Doesn’t Have to Cost the Earth. Citi GPS: Global Perspectives & Solutions. CTI (2012). Unburnable Carbon – Are the World’s Financial Markets Carrying A Carbon Bubble? London. Carbon Tracker Initiative. CTI (2013). Unburnable Carbon 2013: Wasted Capital and Stranded Assets. London. DeMelle, B. (2014, 10 December). Lima COP20 Climate Summit Marked by Protests, Publicity Stunts, and PR Promises. DeSmog Blog. Democracy Now (2014, 3 March). XL Dissent: 398 Youth Arrested at Anti-Keystone XL Pipeline Protest at White House. Divest Harvard. (2014, 15 December). Divest Harvard Statement on Black Lives Matter. Goldenberg, S. (2015, 24 March). UN Climate Chief Joins Alumni Calling on Swarthmore to Divest from Fossil Fuels. The Guardian. Grady-Benson, J. and Sarathy, B. (2015). Fossil fuel divestment in US higher education: student-led organising for climate justice. Local Environment: The International Journal of Justice and Sustainability. Henn, J. (2014, 5 December). A Fossil Fuel Scandal at the Climate Talks in Lima. Huffington Post. IEA (2014). Energy Technology Perspectives 2014: Harnessing Electricity’s Potential. Paris. IPCC (2014). Summary for Policymakers. In: IPCC. Climate Change 2014: Mitigation of Climate Change. Contribution of Working Group III to the Fifth Assessment Report of the Intergovernmental Panel on Climate Change. King, E. (2015a, 23 January). World Bank Chief Backs Fossil Fuel Divestment Drive. Climate Home. King, E. (2015b, 18 August). Terrifying Math: How Carbon Tracker Changed the Climate Debate. Climate Home. Klein, M. A. (2015, 20 February). Divest Harvard Plans Weeklong Sit-In. The Harvard Crimson. Klein, N. (2014). This Changes Everything: Capitalism Vs. The Climate. New York: Simon & Schuster Paperbacks. Kofler, B. and Netzer, N. (eds) (2014). Towards a Global Energy Transformation. Friedrich Ebert Stiftung. Kutney, G. (2014). Carbon Politics and the Failure of the Kyoto Protocol. London: Routledge. Krugman, P. (2015, 5 October). Enemies of the Sun. The New York Times. Langholz, M. (2015, 27 June). How We Move From Access to Influence. SustainUS: U.S. Youth for Justice and Sustainability. Lewis, M. C. (2014). Stranded Assets, Fossilised Revenues. Kepler Cheuvreux. ESG Research. Malitz, Z. (2012). Intellectuals and Power. In: A. Boyd (ed.). Beautiful Trouble: A Toolbox for Revolution (pp. 240-241). New York: OR Books. Massie, R. K. (1997). Loosing the Bonds: The United States and South Africa in the Apartheid Years. New York: Doubleday. McCarthy, S. (2015, 24 September). Divestment Efforts Starting to Hit Coal and Oil Firms. The Globe and Mail. McKibben, B. (2012, 19 July). Global Warming’s Terrifying New Math. Rolling Stone. Meadows, D. (2009). Leverage Points: Places to Intervene in a System. The Solutions Journal, 1(1), 41-49. Mulvey, K., Shulman, S., Anderson, D., Cole, N., Piepenburg, J. and Sideris, J. (2015). The Climate Deception Dossiers: Internal Fossil Fuel Industry Memos Reveal Decades of Corporate Disinformation. Cambridge, MA: Union of Concerned Scientists. Paun, A., Knight, Z. and Chan, W.-S. (2015). Stranded Assets: What Next? How Investors Can Manage Increasing Fossil Fuel Risks. HSBC Global Research. Peeters, W., De Smet, A., Diependaele, L. and Sterckx, S. (2015). Climate Change and Individual Responsibility: Agency, Moral Disengagement, and the Motivational Gap. Basingstoke: Palgrave MacMillan. Pilrainen, P. (2015, 14 June). The Abyss and Salvation. UK Youth Climate Coalition. Rabinow, P. (ed.) (1984). The Foucault Reader. New York: Pantheon Books. Rocheleau, M. (2015, 20 February). Prominent Alumni Ramp Up Pressure on Universities to Divest. Boston Globe. Rusbridger, A. (2015, 16 March). The Argument for Divesting from Fossil Fuels is Becoming Overwhelming. The Guardian. Sachs, J. D. (2015, 9 October). Our Era’s Moonshot: Deep Decarbonization. Shanghai Daily. Supran, G. and Achakulwisut, P. (2014, 12 December). Fossil Fuel Companies Grow Nervous as Divestment Movement Grows Stronger. Grist. The Global Call for Climate Action (2013, 8 November). Global Youth Call on UNFCCC Head to Cancel Coal Summit Attendance. Yona, L. (2015, 1 September). Arctic Climate Summit: Do Leaders Love Their Children Enough? Climate Home. Leehi Yona is pursuing a BA in Environmental Studies and Biology (Minor Public Policy) at Dartmouth College in Hanover, New Hampshire. Yona has studied Arctic science and policy as a Penelope W. and E. Roe IV Stamps Scholar and James O. Freedman Presidential Scholar at Dartmouth. Yona is also a community organiser and has worked on several youth climate justice campaigns, including Power Shift Canada and USA and the Divest Dartmouth fossil fuel divestment campaign. Yona is a recipient of the Lieutenant Governor of Québec’s Youth Medal and was named Canada’s Top Environmentalist under 25 in 2013. Alex Lenferna is a South African Mandela Rhodes and Fulbright Scholar at the University of Washington, conducting his PhD focusing on climate justice. His research has examined a range of related topics, including climate change-induced migration, geoengineering, carbon taxes, climate reparations, global poverty and the rights of nature. He is heavily involved in Divest University of Washington, the Gates Foundation Fossil Fuel Divestment campaign and the 350.org Seattle City Employees Retirement System Divestment Campaign. Drawing on his research and advocacy work, he is currently writing a book on the fossil fuel divestment movement and climate justice. He is also on the steering committee of Carbon Washington, a non-profit advocating for a progressive revenue-neutral carbon tax in Washington State.